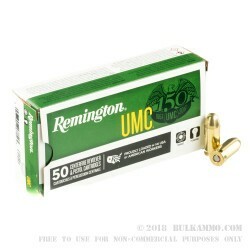 This .45 ACP ammo by Remington is a great choice for some affordable ammunition to keep your skills sharp at the range. The round features a heavy 230 grain metal case bullet that leaves the barrel at 835 feet per second with muzzle energy of 356 foot pounds. Each reloadable round has a brass case, boxer primer, and non-corrosive propellant. Remington has been manufacturing ammo for over 150 years, and all of this experience leads to some of the highest quality ammunition you can find. Remington ammunition is manufactured in Lonoke, Arkansas. 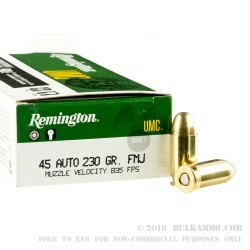 Review by "Hippie with a gun"
Ended up saving over 20.00 over the ranges price for the same ammo when combined with my shooing buddies order. Gone through half the box with only 1 fouled round. That could be a coincidence too. 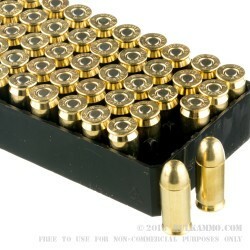 Q: Does the metal cased bullet for these Remington.45 cartridges contain any steel; Will they stick to a magnet? A: Craig this Remington .45 ammo use a lead core copper-jacketed projectile and are loaded into brass casings. There are no magnetic components in the production. 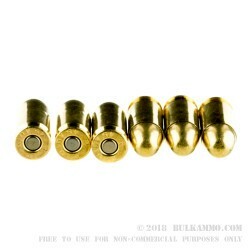 Q: Are these Remington .45ACP rounds (500 count) new or reloads? A: This is all first run, factory new ammunition. If it were a reloaded product we would of course disclose that information in the product details.